The coast of North Carolina is replete with history and beautiful beaches. It is a great area for sightseeing, camping, and enjoying a day under the sun. 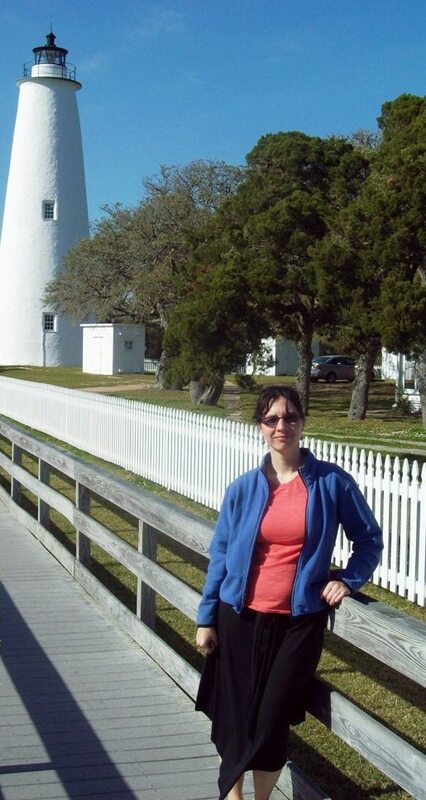 One really interesting part of the Outer Banks are the lighthouses. The lighthouses each are distinct structures, and have incredibly interesting histories. So many ships have been guided in the night by these beacons that offered light and guidance to weary sea captains who braved the high seas. This lighthouse stands midway between the Atlantic and Pamlico Sound to guide mariners up the inland North Carolina coast. The US Lighthouse Board built it. The first version was completed in 1847 south of the Oregon Inlet. It stood 54 ft. tall, but began to lean to one side shortly after completion of construction. The 1847 lighthouse had no foundation and with sand erosion, you can imagine why it didn’t last very long. Keepers had to abandon it by 1854. Mariners, however, desperately needed this lighthouse. It provided an essential signal for captains to turn their ships eastward out to sea. One million bricks make up its double-wall structure. It still has its characteristic flash: 2.5 seconds on, 2.5 seconds off, 2.5 seconds on and 22.5 seconds off, for a total of two cycles per minute. Each lighthouse on the Outer Banks has its own characteristic feature. Bodie Island Light Station has horizontal stripes. Ships would follow a southerly cool current to make their way down the coast a little more quickly. 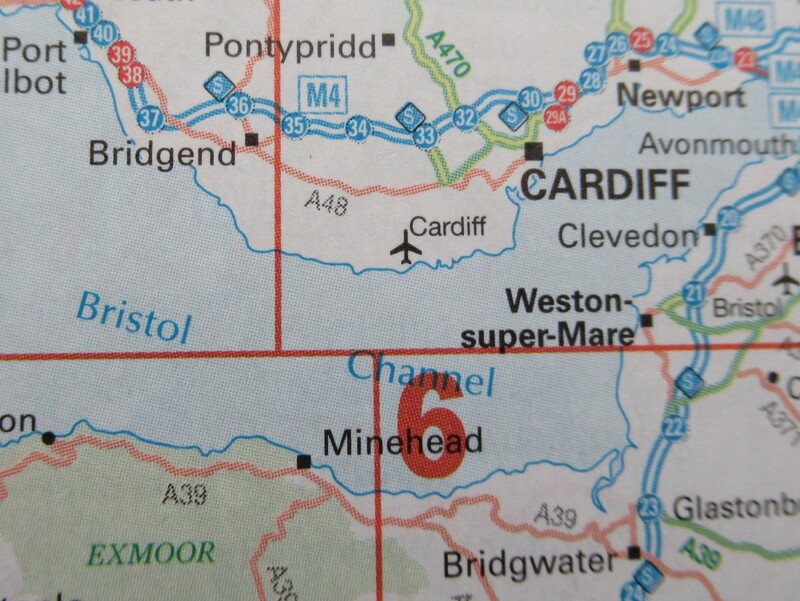 The southerly current hugged the coast and made for faster, shorter travel. A mere 20 miles out to sea, though, and they would hit the north-flowing, warm gulf current. 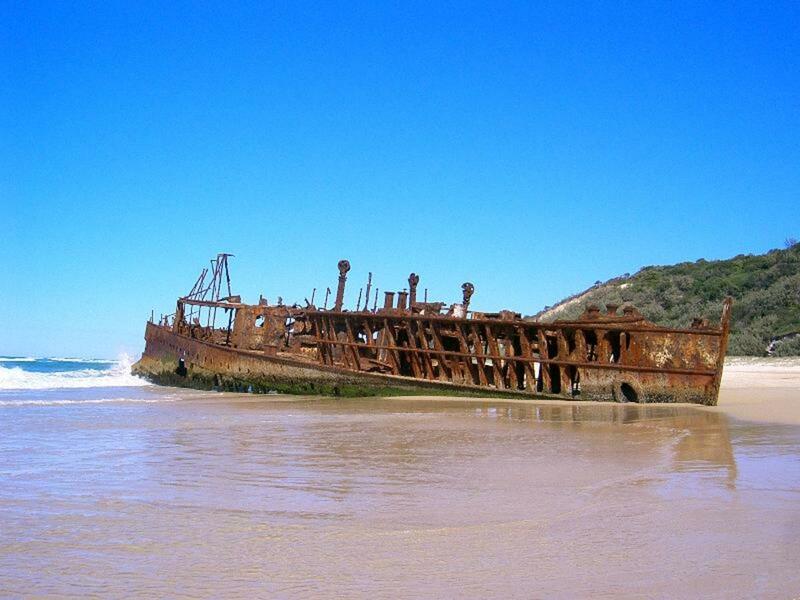 If ships didn’t start turning eastward out to sea at Bodie Island, though, they risked hitting the Diamond Shoals. 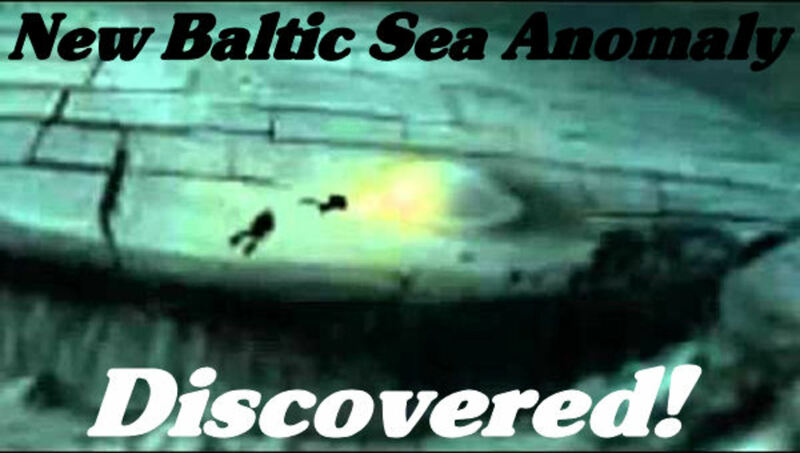 This is why the Outer Banks have the reputation of being the “Graveyard of the Atlantic.” Hundreds of ships have met a watery grave in these shallow shoals – which were shallow waters, and often very rocky. Workers completed the second lighthouse in 1859. This time, it had a secure foundation. Unfortunately, however, this masterful lighthouse would live a short life. Confederate troops destroyed it in 1861. They wanted to make it more difficult for Union armies to navigate. 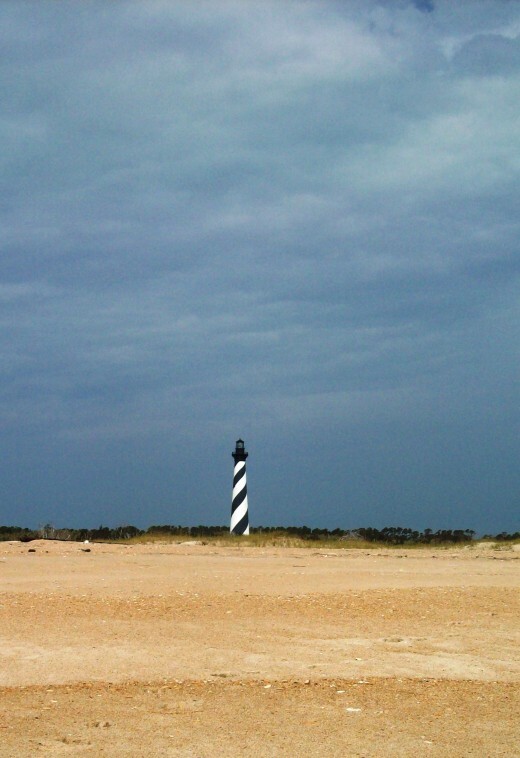 It wasn’t until 1872 did Bodie Island get another sorely-needed lighthouse. 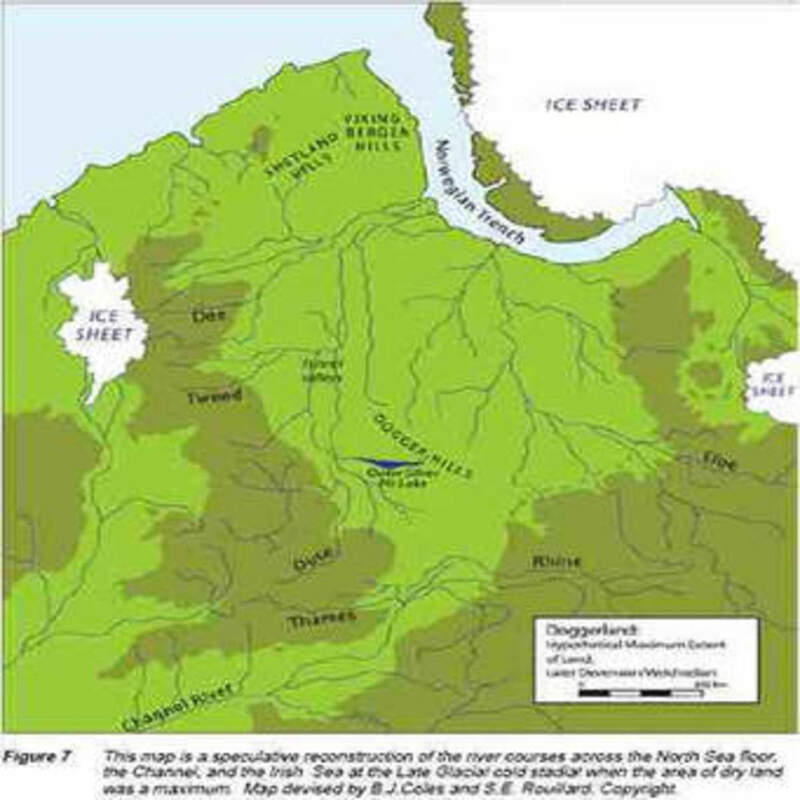 This third structure is located farther north than the other two sites because erosion threatened their foundations. The third tower still stands today. It sits atop a firm yellow pine grid foundation topped with granite rock to make the foundation structurally sound. This most recent lighthouse still has a first order Fresnel lens. 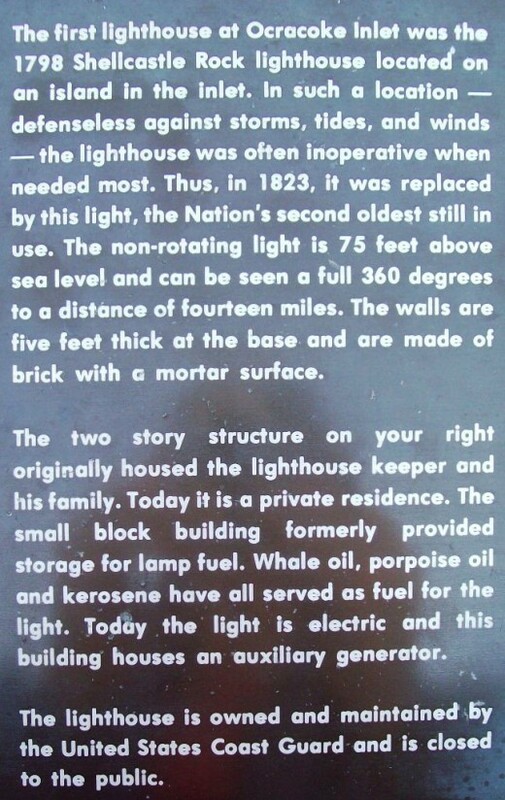 Lighthouse keepers had to haul 5 gallons of oil (usually whale oil) up the 214 steps to the lantern room. The light output from the lens would guide mariners on Pamlico Sound and on the Atlantic Ocean. In 1932, the Lighthouse Service electrified the structure. They installed an incandescent light. Now, batteries that sit in workrooms below the lamp provide light for sea captains navigating up and down the coast of the Outer Banks. Thanks to GPS and modern technologies, ships no longer need the lighthouses for navigation. They still continue to light the darkness across the Outer Banks for smaller, local vessels. I think they also keep them lit for the "coolness" factor. It has 268 steps made of iron that spiral to the top. Its characteristic flash is one flash lasting 2.5 seconds every 7.5 seconds. This results in eight flashes per minute. The outer walls of the lighthouse are comprised of 1.25 million bricks. Like the Bodie Island Light Station, the Cape Hatteras lighthouse has had more than one tower in its 200-year history. 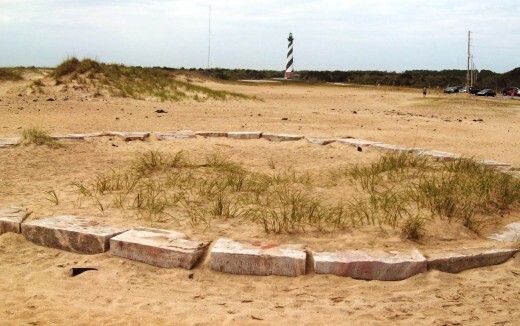 The first Cape Hatteras structure was completed in 1803. Mariners needed this light to help them navigate the waters around the cape. The offshore currents often produced (and still do) violent storms and rough waters with low visibility. These currents also made the area prone to shoal formation. These shallow waters could catch navigators off guard. After much spearheading, Congress finally approved the construction of the first coastal warning light. The first tower stood 90 ft. tall and had 18 whale oil-fed lamps. Unfortunately, seafarers complained that they could barely see the lighthouse. In 1854, workers heightened the tower to 150 feet and added a Fresnel lens. They also built quarters for the lighthouse keeper. Unfortunately, the same forces that would threaten the Bodie Island foundation also wreaked havoc with the Hatteras tower. Basically, it was on a large sand dune that was slowly eroding away. After the Civil War, the Lighthouse Board agreed to build a new lighthouse to guide mariners. The second tower was completed in 1870. It stands 200 ft. tall and is still the tallest brick lighthouse in the world. The foundation of this lighthouse is similar to the Bodie Island structure. The bottom of the foundation includes a grid of yellow pine wood submerged three feet deep and surrounded by fresh water. Thick slabs of granite rest on top of the pine, making the wood as strong as steel. Even with this strong, sturdy foundation, the lighthouse would still fall victim to erosion. In the 1930s, workers attempted to compensate for the erosion that threatened the foundation. Salt water risked seeping through the sand, infiltrating the freshwater surrounding the pine. In 1936, the lighthouse had to close. In 1950, however, the National Park Service, in conjunction with the US Coast Guard, reopened the tower. Erosion was still a problem, however. In 1989, civil engineers working with the National Park Service began plans for a project that would be a monumental undertaking: to move the entire lighthouse 2,900 feet southwest of its current location. In 1999, the lighthouse was moved so that it currently sits 1,000 feet from the ocean’s edge and safe from erosion. This project was so incredible that in the year 2000, the project received the Outstanding Civil Engineering Achievement Award. 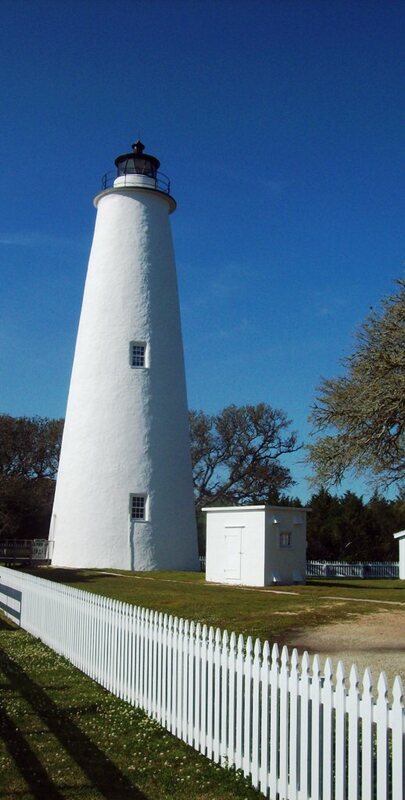 Like the other lighthouses, Ocracoke Light Station has distinctive characteristics. It is all-white in color. Instead of flashing, its light shines continuously. The focal plane of this lighthouse stands at 75 feet tall. One side of the lighthouse is steeper than the other.The lantern room is also off-center.There is no known documentation as to why this is the case. As early as the 16th century, the British began including Ocracoke Island on their navigational maps. They knew it was going to become an important passageway on the way to the North Carolina mainland coast. Bigger ships had to stop at Ocracoke to unload cargo into smaller vessels that could traverse the shallow Pamlico Sound to important ports at New Bern, Bath, Plymouth and others on the mainland North Carolina coast. The sands in and around the inlet would shift and could catch mariners off guard if they didn’t know the channel. Thus, many larger ships and other companies would hire boat pilots to guide their cargo in and out of the inlet using the smaller boats. 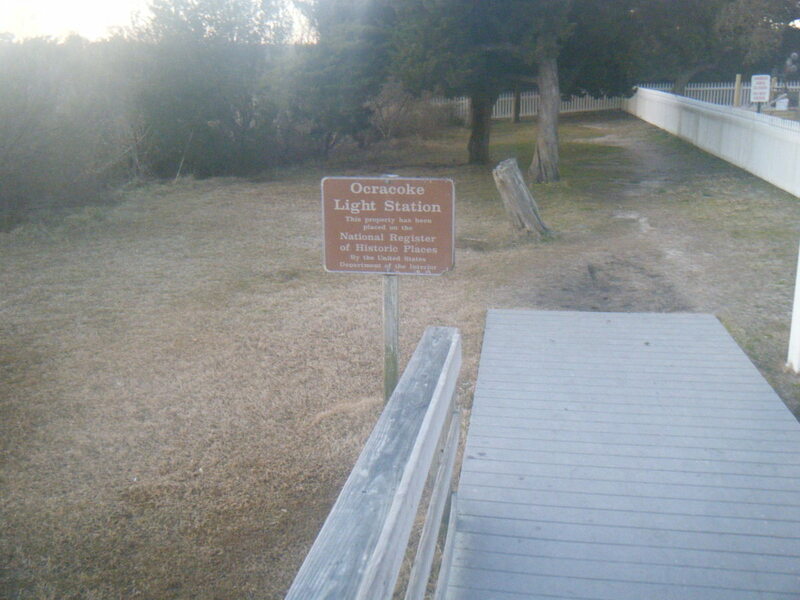 Because the inlet was so busy, Ocracoke became one of the first places to put up a light signal. In 1733, the first lights appeared, but they weren’t part of lighthouses. They were called “range lights.” The range lights were two lights lined up behind one another. If mariners lined them up as they traveled, they could navigate through the inlet more confidently. 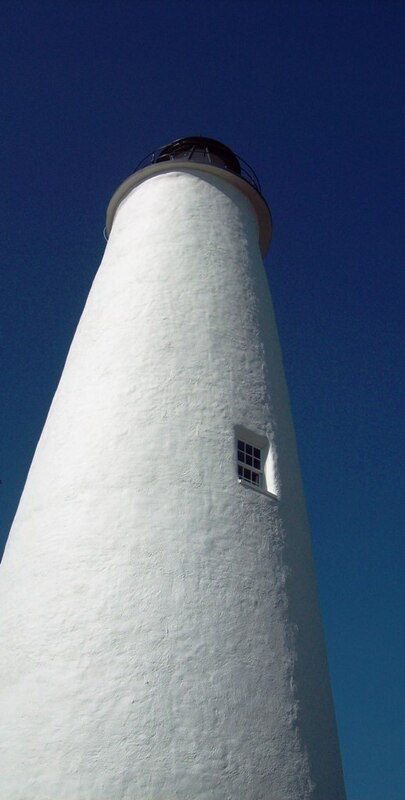 In 1803, the first Ocracoke lighthouse shined its light into the dark seas. 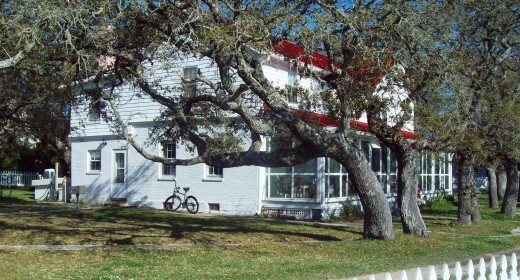 It stood on Shell Castle Island, on the south side of the Ocracoke inlet. The island was made of oyster shells. In 1818, a lightning strike destroyed the lighthouse, however. When a new lighthouse was in the works, shifting sands forced relocation to Ocracoke Island itself, where it still stands today. It was completed in 1823. Ocracoke Light Station has been burning for almost two centuries and is the oldest functioning lighthouse in North Carolina. A brief period during the Civil War forced the lighthouse to go dark for a time. Confederate soldiers removed its lens. In 1864, the lighthouse was fitted with a new fourth order Fresnel lens. By the mid nineteenth century, mariner traffic had largely moved north from the Ocracoke Inlet. Hatteras and Oregon Inlets opened for passage through to the North Carolina mainland. Today, the lighthouse helps to serve as a guide for local boats and ships as they navigate through the Inlet. Which Lighthouse Seems Most Appealing To You? How beautiful, this is awesome and I have enjoyed learning about these places very much. Light houses are so interesting to me. Great hub. I am from Wisconsin. it is a 27 hour drive for me to go to Cape Hatteras every year and well worth the effort. I've been doing it for 20 years and literally live all year long for that trip. When I exit Avon and come around that bend in the road I can see the Cape HATTERAS LIGHTHOUSE in the distance and my first thought is "I'm home". There are no Ferris wheels, roller coasters or bungee jumps. 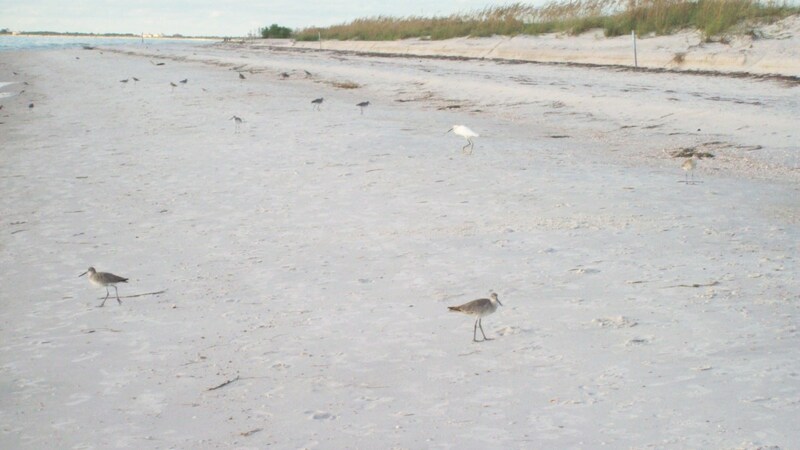 Just a lovely, peaceful, quiet place to forget the cares of the world for one sweet week, watch the pelicans, seagulls and sand crabs, eat delicious fish (not to mention Apple Uglies from the Orange Blossom Bakery) and just be quiet and peaceful. Each year when I leave I pray, "Please dear God, just let me see this one more time". Victoria Lynn - thank you so much! I hope to visit ALL the lighthouses on the coast of NC sometime. Have a great day! Cheers! Lighthouses are so cool and interesting. Well done hub, CC! Just Ask Susan - these lighthouses are so interesting and beautiful...it's definitely worth a little side trip to go see them. :) There are actually a few more on the NC border, but they're far apart and some you can only get to by ferry. I'd love to go see those sometime! Thank you for stopping by. Kelley - thank you for coming by and commenting. :) I never knew much about these either until my husband and I started a yearly tradition of going camping at the beach and we try to visit new and different places every time. I learned a lot on this last trip. Thank you for the votes and shares! I've been so close I wish I'd have known about these lighthouses before as lighthouses fascinate me. Next time on my way down to Florida I'll have to make a side trip. I love it! 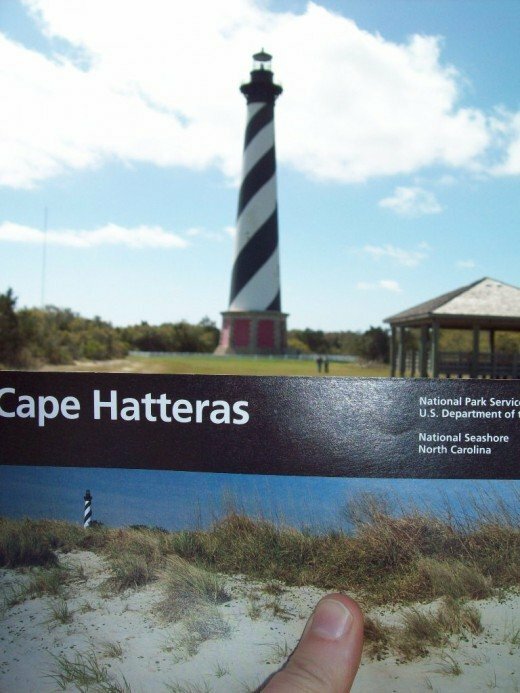 When I was a child I went to Cape Hatteras every year. My parents are fishermen. We used to go to the light house before it was moved but we could never go in it. This is fabulous. There is nothing better than a non-commerical, non-spoiled beach. Years later when going to Myrtle Beach, it was a bit of a disappointment with the traffic, crowding, noise, and massive commercialism. Great hub! I've never actually visited a lighthouse but do love to look at photos and imagine the sight from the top! Am soooo glad these architectural marvels weren't torn down when GPS devices became common for navigation. Some unused lighthouses are now available as unique vacation cottages! WD Curry - Wow! What a story you have to tell! That's great you got to surf those waves before the hurricane hit. I love that idea: run up the lighthouse for exercise. I'll have to try that next time I'm in the Outer Banks. There is quite a bit of development, but I'm charmed by that older, shabbier element that exists on the OB, too. We stayed at a campground next to a guy with 100 bikes in his front yard. It definitely made our trip more interesting but in a fun way. :) Thanks for stopping by. We used to stay out on Hatteras when there was no warm water at the one national park campground. There were no others. We refused to leave for a hurricane, once. I had a feeling about it. It veered at the last minute and made the biggest, best waves I have ever surfed. We used to run up and down the lighthouse stairs for exercise on flat days. We ate a lot of fish and spent little money. I am glad I got to enjoy it before all of the development started. Your well written article took me back to one of my favorite places. I love lighthouses so much. I have seen 4 in real life, but that is not nearly enough. Thank you for sharing such awesome information and photos. Enjoyed it very much! I've never been to that part of the world but a lighthouse tour would be worth it. Do you know if these are open to the public? Voting this Up and Interesting. I didn't know these were so close to Florida. We were thinking of taking a trip up north to Maine to see some lighthouses this fall. I will have to check into this option as well. Thanks for the history lesson - loved the photos and video. Voted up! You know what's funny? I've lived in South Carolina and Tidewater Virginia, which is very close to the Outer Banks, but I have never visited the Outer Banks! Thanks for the information and the cool pictures. Voted up and interesting.